These look so good! Pinned and I can’t wait to try them! Why would you out the recipe at the end of the recipe. this does not make sense. why would you put the ingredients at the end of the recipe??? Hi Silvia – I am not sure what you are referring to. The ingredients are all listed in the recipe card at the end of the post. If you are talking about the button that says “Get Ingredients” that is a link to a service where you can buy ingredients for the recipe online. All of the ingredients that you need are listed right there on this post though. Let me know if you are talking about something else. Thanks! Made these with lunch. Absolutely fantastic! I used the same batter on zucchini stick, too. Yum. Why does the egg mixture look red? Did not see an ingredient to turn it red. Hi Danny, thanks for your comment. The paprika that is in the flour mixture is what gives it the red color. 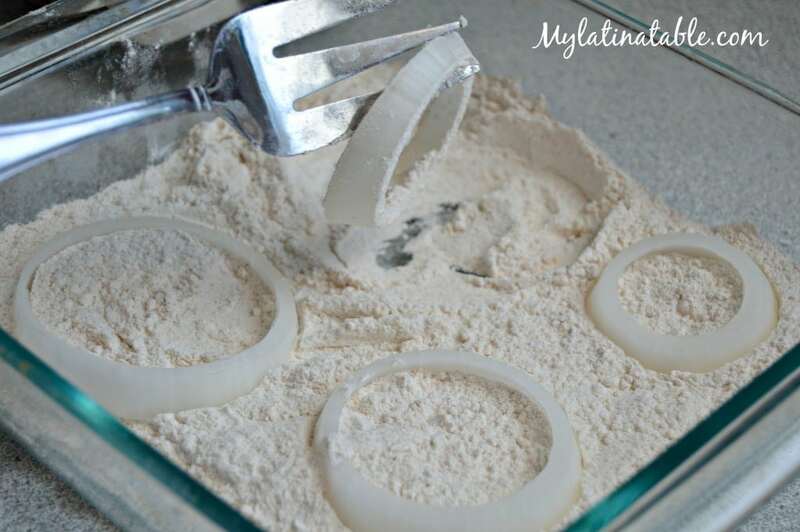 After coating the onions rings in the flour mixture, you are supposed to combine the remaining flour mixture with the egg mixture and stir. It is the paprika that gives it that color. Hope that helps! Can you use Panko bread crumbs? Yes, you should be able to use Panko. I haven’t tried it, but I don’t see why it wouldn’t work. Let me know how it turns out! I have used panko and it worked out great! 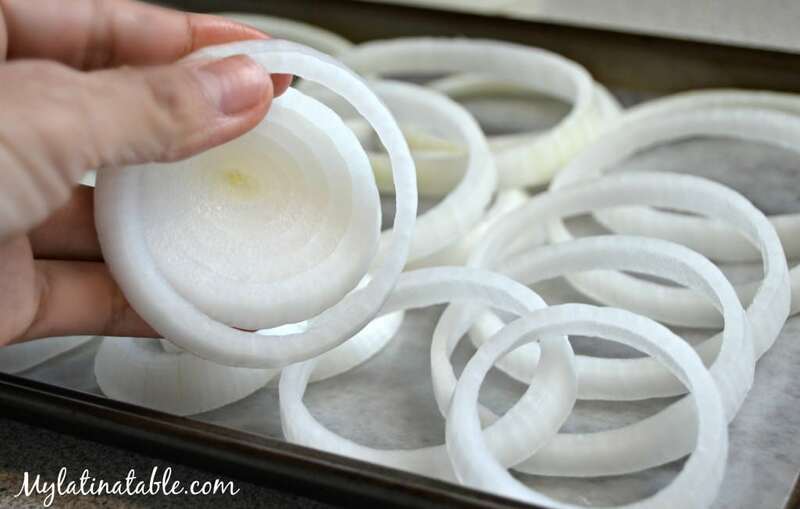 Just make sure you you cover the onion and press firmly for a good sick. My family loves this recipe. Thanks Nina! I am so glad that you liked them 🙂 They are definitely a favorite around here. Can you tell me how much flour is added to the egg and milk mixture it doesn’t state it within the recipe? Hi Nicole. The way this works is that you create the flour mixture like it explains in the recipe, and you first coat the onions in that flour mixture. Then you add all of that same mixture to the egg and milk mixture and stir before coating the onions in that as well. Does that make sense? How long are you suppose to cook them for? 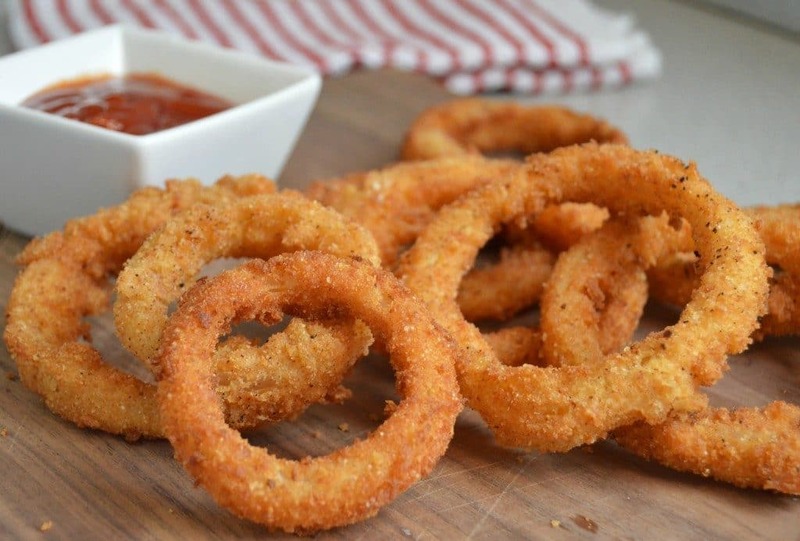 If the oil is already hot, each onion ring should only take between 15-30 seconds. The best way to do it is just to check them pretty quickly after putting them in, because when they are golden brown, they will be ready. Can you bake these rather than deep fry them? I can’t find the video or instructions. Hi Kim – the video is embedded into the post, but if you are still unable to view it, here is a link to the video on Youtube: https://www.youtube.com/watch?v=MjuOrmO1-dc. Thanks! Hi Linda – the video is embedded into the post. If you still aren’t able to see it, here is a link to the video on Youtube: https://www.youtube.com/watch?v=MjuOrmO1-dc thanks! I am going to try this one. I can never get mine the way it looks in the picks. Looks yummy. Thank you. How much is “remaining flour” when it says ‘Combine the remaining flour mixture with the milk, egg, and salt and beat well until no lumps remain.’ I see 1/2 cup for the first layer of dredge. Thanks so much! So you are supposed to combine the 1/2 cup of flour with the baking powder, salt, and paprika – that is the flour mixture. 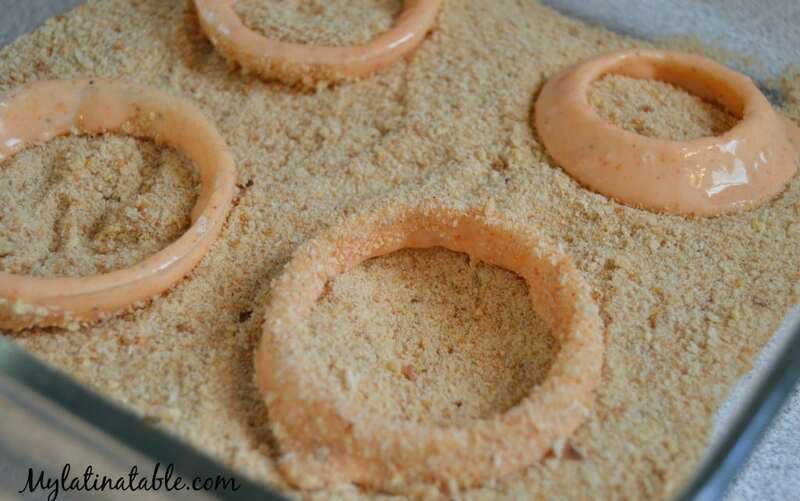 Then you are supposed to coat the onion rings in that flour mixture. Once you have done that, you take whatever is left of that flour mixture and combine it with the milk, egg, and salt. 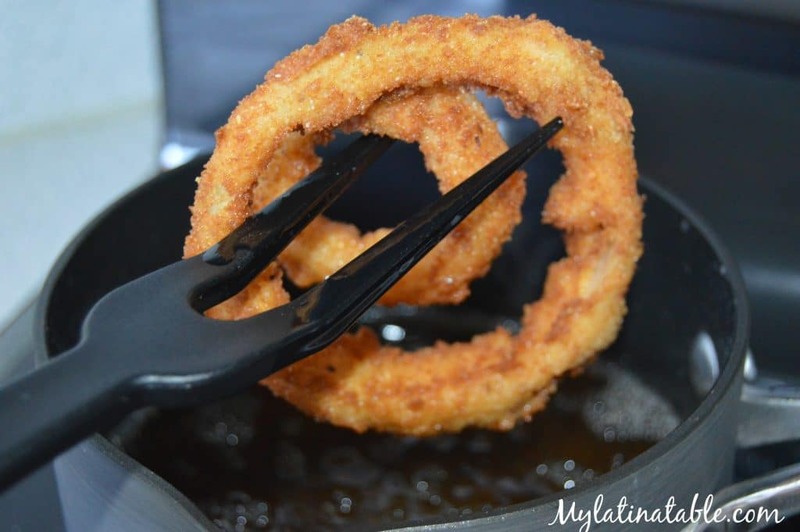 Then you will coat the onion rings in that mixture (it will be somewhat thick) before frying. Hope that helps. Thanks! JUST finished making these! SOSOSOSOSOOOO good! 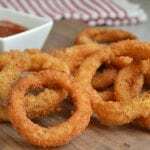 rather than letting the excess batter drip, I just immediately coated the rings in the bread crumbs, and it gave them the extra crunch. Thank you so much for this recipe!